In Mexico, a country with deep-rooted Christian traditions, the Holy Week is a national holiday, with all schools and many public and private companies closed during those day. Along the Mexican territory and almost in every town and village, during this week people carry out a variety of interesting celebrations to commemorate the passion, death, and resurrection of Jesus Christ. Although these celebrations may vary depending on the customs of each community, there are certain elements that are pretty much the same all over the country. The traditions of Holy Week are particularly interesting and colorful in some towns and cities, due to the great devotion of the locals and the variety of folkloric elements added to each celebration. In the state of Michoacan, for instance, many towns and cities hold massive, solemn celebrations on Holy Thursday, Good Friday and Holy Saturday. In most of them, people carry out colorful processions with statues of Jesus Christ or hold Passion plays. Some of the most spectacular celebrations of the Holy Week in Michoacan take place in towns like Patzcuaro, Tzintzuntzan, Huandacareo, Tarimbaro and Uruapan. In San Miguel de Allende, Holy Week is a period eagerly expected by hundreds of tourists who wish to take part in the series of events held in the city, including the processions, the "Via Crucis" (Latin for "Stations of the Cross", a recreation of the Passion of Jesus Christ, from its trial to its crucifixion,) and the liturgical rites. On Good Friday, besides the spectacular Via Crucis, the townspeople carry out the "Procession of Silence," around the main streets of the city. This procession is held in absolute silence, with the participants using black costumes as a sign of mourning for the sacrifice of Jesus Christ. In Iztapalapa, an area in Mexico City, the Stations of the Cross on Good Friday becomes a titanic, spectacular celebration that gathers people from all around Mexico and the world. In fact, the Passion Play in Iztapalapa is so impressive that both national and international media cover the event from the beginning to the end. All the community participates in this celebration, organizing the rehearsals, the logistics, the dressing and making up of the characters or directly in the acting. It is in this way that the recreation of the Passion in Iztapalapa has become a massive celebration on an international level. There are many other colorful and spectacular celebrations throughout the country, including the series of processions carried out in the city of Taxco, which are considered among the most impressive in the nation. The Procession of Silence in San Luis Potosi also stands out. It is held on the evening of Good Friday, with several congregations using their traditional costumes. Other places with interesting celebrations include Queretaro, the capital of the state of the same name; Creel and San Ignacio Arareco in Chihuahua; Jerez, in Zacatecas; Atlixco, in Puebla; Temascalcingo, near Toluca; San Juan Chamula and Zinacantan in Chiapas; and Mani in Yucatan. 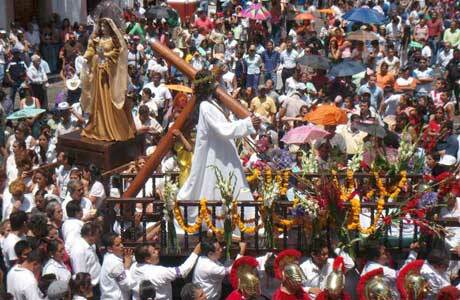 The Holy Week in Mexico is far more than a set of colorful recreations and processions. It is the greatest expression of the culture, faith and unity of a country through its traditions. The sense of family, hope and hospitality of the people reaches its peak in these customs that involves the grand majority of Mexico. Regardless of which city you decide to visit for the Easter festivities, you will most definitely find a spectacular display of faith and tradition. Discover the enormous spiritual richness of these celebrations while taking part in an experience that opens the mind and enriches the soul of those who live it with an honest heart. This Holy Week, enjoy the cultural richness of Mexico!